Last month, I discussed the historic landing of the Philae lander on to the surface Comet 67P, delivered by ESA's remarkable Rosetta space probe. I pointed out the 'elephant in the room' - that the comet's surface was composed of rock rather than ice, in sharp contrast to the expectations of a dirty snowball held by the mission scientists and engineers when the lander was first designed (1). Once inside the coma, which has always hidden the comet's true identity like a shroud, it has become apparent that these objects look a lot more like regular asteroids than dirty snowballs. Sure, there is water ice, but it's evidently mostly confined to the interior of the rocky comet, released through outgassing during the comet's perihelion passage. 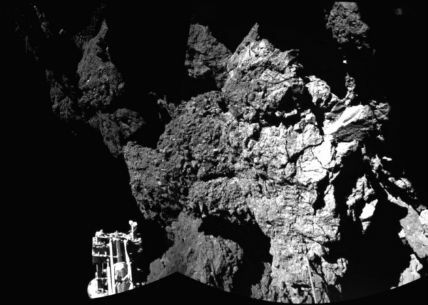 ESA's work on the data returned by the Philae lander clearly demonstrates that the water composition of the comet is unlike that of the Earth's (2). Although there have been some cautionary comments made about such a definitive judgement by other scientists, it is difficult not to draw the conclusion that the theory of Earth's water having been delivered by 'dirty snowball' comets is in rapid decline. Professor Altwegg has also proposed a rethink of the origin of these Jupiter-family comets, potentially diversifying the range of their formation over a wider spectrum of the solar system (3). This marks another step change in our understanding of comets and asteroids, the characterisation of which are gradually merging. "[In August 1996, Paul] Weissman and [Hal] Levison... calculated that, along with a trillion or so comets, roughly 8 billion asteroids could have been flung out into the Oort Cloud by close planetary encounters early in solar-system history. This proposed variability of source for the countless Oort Cloud objects has recently been tested theoretically, using computer simulations, and these have come up with similar estimates for the population of these stray asteroids that were implied by the asteroid characterisation of 1996 PW: possibly around 8 billion. That implies a lot of crashing about in the early solar system, with a wide debris field of scattered rocky objects as a result. Who's to say that a great number of the more icy comets were not similarly placed into the Oort Cloud from the same catastrophism? 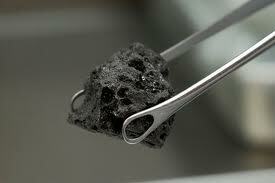 I think that this comet/asteroid debate is becoming a 'chicken and egg' argument. 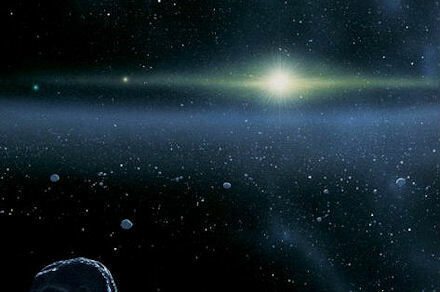 Until recently, it was thought that the asteroids are dry rocks because they were relatively close to the Sun and lost their volatiles, whereas the comets were dirty snowballs forming in the cold depths of the solar system from the volatile ices expunged from the planetary zone by the action of the solar wind. However, now it appears that the waters of the outer part of the asteroid belt match that of Earth; and that the comets are more rock than ice, and more often than not contain water quite unlike the Earth's. So, if the Earth's water came from the asteroid belt, and the asteroid belt and the Earth are 3AU apart, then how did it get here? It makes no sense, unless the Earth and the asteroid belt share a common factor - a catastrophic event of cosmic proportions. In the item above, we read about how the giant planets are thought to have migrated across the solar system - their orbits varying wildly over time. Yet, no one in the field of science seems willing to suggest that the Earth might also have started its life in a different location than it currently resides in. If the Earth began life between the orbits of Mars and Jupiter, then we might readily explain why the waters of the asteroid belt, the Earth, and the Moon, all seem to share a common origin. "The findings hint that water may have existed on Earth before the giant impact the planet received that created the moon, and that the moon possessed water from its earliest moments, scientists added. It remains a mystery exactly how water found within the moon survived this violent collision, though. Water is vital to life as we know it, with organisms found virtually everywhere there is water on Earth. When Earth was born, the ingredients of the planet's water most likely would have formed beyond the orbit of Earth. "... in 2011, Erik Hauri of the Carnegie Institution of Washington and his team analysed rocks that were ejected from the moon's interior. Within the rocks were "melt inclusions" – tiny globules of once-molten rock trapped inside crystals – which contained 615 to 1410 parts per million of water, comparable to the levels of water in the Earth's upper mantle. If a Mars-sized body impacted a watery early Earth (hey, let's call it 'Tiamat'), then statistically some of that huge volume of water would have survived in both the damaged Earth and the reforming Moon. It's only the Earth/Moon's proximity to the Sun that provides the problem here, because the solar wind should drive off the volatiles. But if the nascent Earth/Moon system was located, say, at 4AU rather than the current 1AU, then that problem evaporates away. It would also readily explain why the waters of the Earth and Moon share so many characteristics with the asteroids of the outer asteroid belt: Because they're all part of the same primeval pot. Only later, during the late, heavy bombardment 3.9 billion years ago, did the Earth/Moon system get flung further into the inner solar system - a migration resulting from a great celestial battle with the Dark Star (8); Zecharia Sitchin's "Nibiru/Marduk" (9). Image credit: Dana Berry, Harold Levison, Dan Durda, SwRI. Habitability of Low Mass Star Systems Cast into Doubt? It's been fashionable recently to consider red dwarf star systems as likely repositories of life. These low mass, 'M-dwarf' stars are smaller and cooler than the Sun (a yellow dwarf star), so any likely habitable planets would be located much closer to their host star than the Earth is vis-à-vis the Sun. In a recent study involving computer simulations of fledgling low-mass star systems, doctoral student Rodrigo Luger and co-author Rory Barnes, a University of Washington assistant professor, found that some planets close to these stars would lose their water and atmospheres while they were still forming. "All stars form in the collapse of a giant cloud of interstellar gas, which releases energy in the form of light as it shrinks," Luger said. "But because of their lower masses, and therefore lower gravities, M dwarfs take longer to fully collapse -- on the order of many hundreds of millions of years. Planets around these stars can form within 10 million years, so they are around when the stars are still extremely bright. And that's not good for habitability, since these planets are going to initially be very hot, with surface temperatures in excess of a thousand degrees. When this happens, your oceans boil and your entire atmosphere becomes steam." These conclusions could have wide-ranging ramifications for the search for life on low-mass star systems, as well as the tiny planetary systems likely located around a various types of failed stars. however, these theoretical arguments suffer from a number of practical difficulties, as well as being based upon some potentially false premises. There is an underlying assumption that the conditions prevalent on a planet around a red dwarf at the beginning of its life-cycle are critical to the possibility of life forming later on. Well, the same argument could just as easily be expressed for a yellow dwarf star system where the initial conditions of the Sun's own system are thought to have been inconsistent with the sustainability of water on Earth. Yet, water and life are hallmarks of this planet, despite what theory might say. This leads to arguments about the later arrival of water on comets and/or asteroids, or other mechanisms whereby water might survive the early harsh environment of a fledgling star system. These questions have yet to be resolved satisfactorily. The authors are not taking into account recent findings connecting H/D isotopic ratios between Earth and some comets, and particularly the asteroid 4-Vesta (see Dark Star Blog 20). It seems as though the water on Earth is of a constituency that has parallels elsewhere in the solar system. This provides mechanisms for water to pitch up later in the day onto a potentially habitable world, or even for migration patterns of outer watery planets to shift into habitable zones after the irritable teenage years of the developing planetary system. If the study of real exo-planets tells us anything it's that the universe is a varied and unpredictable place, and that theoretical computer studies like this tend to ignore such diversity at their peril. 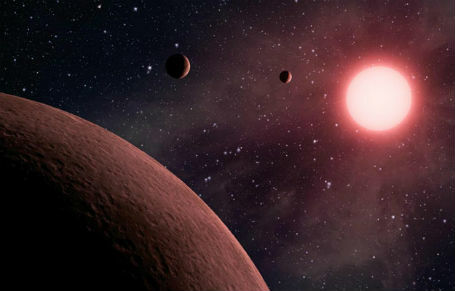 Red dwarf stars and long-lived and stable in nature. they don't blast out the same level of harmful radiation that our Sun does, and so one might logically conclude that they provide better environments for life than might be expected in yellow dwarf systems (a point ably made by Scott Denbina (3) in his comment on the SciTech article about the release of this academic paper). So, does this 'difficulty' apply to the formation of a Dark Star in the outer regions of our solar system, and its potential habitability? It is true that in the case of the brown dwarfs particularly, the initial few million years of the star's life are very different in terms of heat and light output than for its later stages. But, in the case of a 'Dark Star' orbiting the Sun currently, no one's suggesting that this is a new object. Indeed, it is likely as old, if not older than the Sun, and therefore a rather cold, skulking object lying out there in the vast undiscovered regions of the outer solar system. The opportunity for it to harbour life rests in the peaceful nature of its immediate environment, and its ability to provide internal warmth for any planets/moons in its immediate vicinity. Comets provide the rest. Intelligent E.T. could either evolve there independently, colonise the system from afar, or be seeded there. The conditions that prevailed in the first few million years seem almost entirely irrelevant. Over the last few years, the indirect scientific evidence supporting the existence of a Planet X object has been amassing. I've enjoyed reporting on these developments on my websites as they've come to light, as they build upon much of the arguments that I and other researchers have put forward for, well, decades. Last March, astronomers searching for Kuiper belt objects announced the discovery of 2012 VP113, an object which shared certain anomalous characteristics with Sedna. One swallow does not make a summer, it is true, but when two appear then perhaps we can get a little more excited. Both of these objects have orbital properties that take them well beyond the confines of the Kuiper Belt, and indicate, perhaps, that a large planetary object beyond might be playing a part in their trajectories. 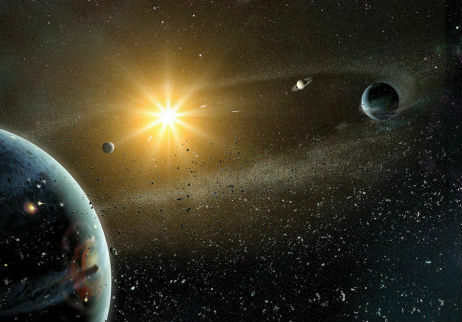 This hypothetical shepherding planet, yet to be discovered, would be several times as massive as the Earth, the scientists think, and lie several hundred astronomical units away (1). "The case for an additional planet got stronger when Trujillo and Sheppard realized that Sedna and 2012 VP113 had something in common with 10 other objects. 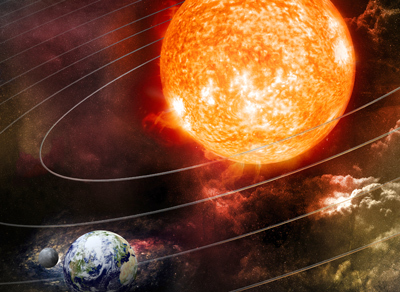 All the objects beyond 150 astronomical units come closest to the sun, a point known as perihelion, at nearly the same time that they cross the plane of the solar system. There’s no reason for these perihelia to bunch up like that. Billions of years of evolution should have left the perihelia scattered, like the rest of the Kuiper belt — unless something was holding the perihelia in place. Pinpointing the critter responsible is proving tricky...perhaps. You see, you can be sure that the race is now on to find Planet X among astronomers specialising in hunting for objects in the outer solar system. This scientific Holy Grail is controversial, not least because of its possible associations with the mythical Nibiru ("If it looks like a duck, quacks like a duck and walks like a duck, it's a duck"). Then there's the question of whether it might harbour life, which adds even more speculation to the mix (3). So, scientists working on this have to tread carefully, and be careful what they say publicly - for two reasons. Firstly, if they're wrong then their reputations will suffer. Secondly, if they're right, then they want to be the first there, so giving too much away might aid their competitors. The trail of crumbs is becoming more easy to follow, it seems, and the posse of Planet X hunters is steadily growing. Another area where comets and meteorites are thought to be affecting the composition of the solar system's planets is deposition of organic material onto the surface of barren planets. So, in the case of Mars, which has been widely assumed to be sterile of life by NASA and most scientists since the Viking lander days, any evidence to the contrary is explained away by those pesky rocks falling from the sky, delivering their minute organic payloads. 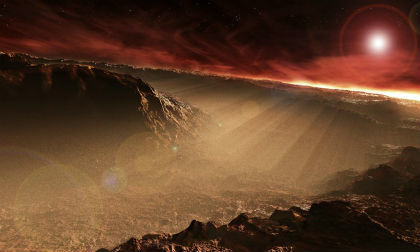 Anything really, other than the suggestion that under the surface of Mars, life might lurk. "The low background level of methane detected by Curiosity could be explained by the Sun’s rays degrading organic material possibly deposited by meteors, the Nasa scientists said. But the spikes of methane required an additional source, which was unlikely to be a recent impact by a comet or asteroid. Such an object would have had to measure several metres across and would have left a large crater, no sign of which was visible. As usual, the possibility of life on Mars has produced a knee-jerk bout of deep scepticism among many media-savvy scientific commentators. But it does appear that their sterile arguments are looking increasingly weak as the data for some kind of organic sub-surface activity mounts. Fellow Planet X researcher Al Cornette recently commented about a History Channel programme he watched about the Sumerian 'Planisphere', an ancient tablet which is part of the British Museum collection (No K8538). The Planisphere was found about 150 years ago by Henry Layard in the remains of the library in the Royal Place at Nineveh. It was made by an Assyrian scribe around 700 BC and is thought to be a copy of a much older Sumerian Planisphere. In more recent times, translation and scientific analysis on the tablet have indicated that the Planisphere records an extraordinary event which took place in the sky before dawn on the 29 June 3123 BCE (Julian calendar) (1). The event appears to describe the movement of a celestial object across the sky followed by an impact event that created an enormous cloud or plume in the sky. Two British scientists, Alan Bond & Mark Hempsell, have proposed that the Planisphere is a description of an asteroid impact event that resulted in one almighty landslide in the Austrian Alps, known as the Köfels' Impact Event (1). "Half the tablet records planet positions and cloud cover, the same as any other night, but the other half of the tablet records an object large enough for its shape to be noted even though it is still in space. The astronomers made an accurate note of its trajectory relative to the stars, which to an error better than one degree is consistent with an impact at Köfels. "The observation suggests the asteroid is over a kilometre in diameter and the original orbit about the Sun was an Aten type, a class of asteroid that orbit close to the earth, that is resonant with the Earth's orbit. This trajectory explains why there is no crater at Köfels. The in coming angle was very low (six degrees) and means the asteroid clipped a mountain called Gamskogel above the town of Längenfeld, 11 kilometres from Köfels, and this caused the asteroid to explode before it reached its final impact point. As it travelled down the valley it became a fireball, around five kilometres in diameter (the size of the landslide). When it hit Köfels it created enormous pressures that pulverised the rock and caused the landslide but because it was no longer a solid object it did not create a classic impact crater. If this all sounds a bit too neat, then you can be sure this has drawn out some stern criticism. Some geologists think that the Köfels' Impact Event is much older than Sumerian times; dating back to about 7800 BCE (3), based upon radiocarbon dating of wood dug out of the landslide. However, this particular evidence is contentious, offering an 'oldest possible time' (which would then be perfectly consistent with the Sumerian dating) or even something of a fudge of conflicting evidence, which Mark Hempsell ably clears up in favour of his 3123 BCE date (4). Sumerologists also have their doubts that the Sumerians were capable of recording astronomical events in such clinically accurate detail (3), but then they would! 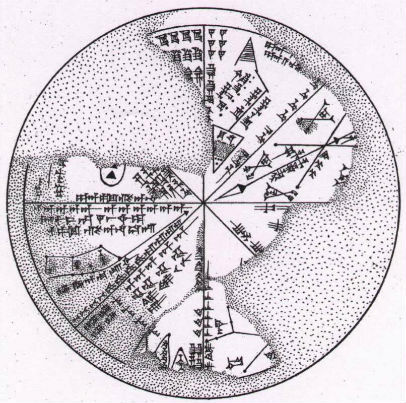 Anything that implies the Sumerians knew how to map the sky accurately is far too close to Sitchin-thinking for them. More on this in a moment. The science, then, appears sound. So perhaps the Sumerians really did record a dramatic event in the sky which resulted in a catastrophic event in the Alps, allowing modern scientists to piece together an incredible event over which occurred over 5000 years ago? As noted in the quote above, in terms of the human consequences of the disaster in Palaeolithic Austria, the worst effects may have occurred across the Levant region (2). This has led others to ponder whether this event may provide an explanation for the Biblical description of the destruction of Sodom and Gomorrah (5,6) leading on to a number of TV documentaries - one of which appears to have been the programme Al saw. Al's points are based upon Sitchin's interpretations, who believed this Planisphere to be describing the descent of a spacecraft from Nibiru to Earth via various solar system landmarks (8). This interpretation rests upon translations by Sitchin that many Sumerologists likely do not agree with. But then, our knowledge of the Sumerian language is far from complete, as they would be the first to admit (5). So, the science itself aside, there is a still a philological debate to be had here before the Köfels' Impact Event theory can be accepted as an explanation for the Sumerian Planisphere. Let's make a bit of a further Sitchinite jump here, just for a bit of fun. What if the date is right, the impact event is right, but the source of the impacting asteroid is incorrect? In other words, what if the impactor was an exploding comet rather than Aten-type asteroid? What if the impactor comet was part of a comet swarm associated with the return of the planet Nibiru in 3123 BCE? This, then, would put the Sumerian description of the event in the sky in sharp relief, and explain why Sitchin equated this event with the return of the Anunnaki. The date also corresponds with important historical events, particularly the establishment of Dynastic Egypt through the unification of Upper and Lower Egypt: Modern consensus dates the era of Menes or the start of the first dynasty between c. 3100–3050 BC, which is not that long after the date of 3123 BCE discussed above. Let's also assume that Sitchin was roughly right about the orbital period of this rogue Planet X Nibiru, at 3600 years. That would mean that the next appearance of this Planet X body would have occurred during the time of the European Dark Ages, a period also widely associated with some kind of widespread calamity blighting the Earth. There are contemporary accounts of a dimming of the Sun, both in Europe and China, as well as the appearance of 'dragons' in the sky, and other unusual phenomena (9). Some astronomers have suggested that comet swarms might account for these kinds of events; the cataclysmic descriptions of which were enfolded into myth rather than the kind of scientific observation we are more accustomed to today. So, I wonder whether such comet swarms might be associated with Sitchin's rogue planet, Nibiru? These dates would be at odds with those he suggested, but in many ways they would make as much sense (or non-sense, depending upon your point of view) as the arguments he put forward in his books. I'm not particularly wedded to this idea, but just offer it as food for thought. My favourite event of this year was without doubt seeing metal legends Mastodon at the O2 Academy at Bristol earlier this month. I went along with a bunch of my metal-head mates, and couldn't help but drift down from the balcony to the main floor for the feature act. Which meant sampling the delights of the mosh pit. I guess I might be getting a bit old for all that these days, but I managed to keep my feet and thrash the night away with the young bucks who amassed in the middle of the gig floor. I apologise to the chap who I inadvertently head-butted in the face.